What is an automatic baler? Automatic baler is typically loaded from the top and you can link it to any skid load, in-feed conveyor, as well as air blown systems to achieve full automation from material feeding to tidy bales, and automatically discharged onto a rolling conveyor. These larger and faster horizontal automatic baler machines are also the top choice for MRF’s (materials recovery facilities) recycling operations. 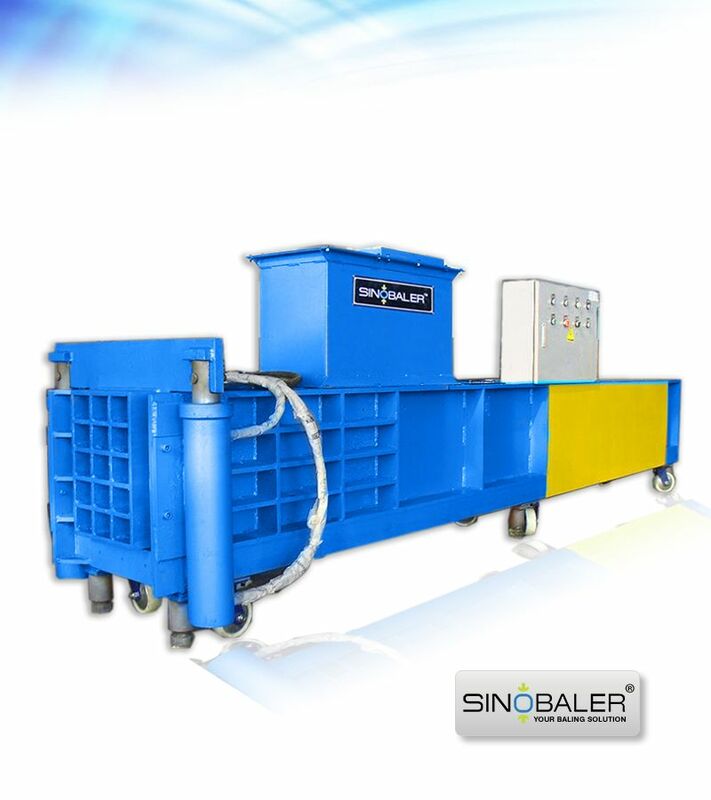 Do you know Sinobaler automatic baler machines? 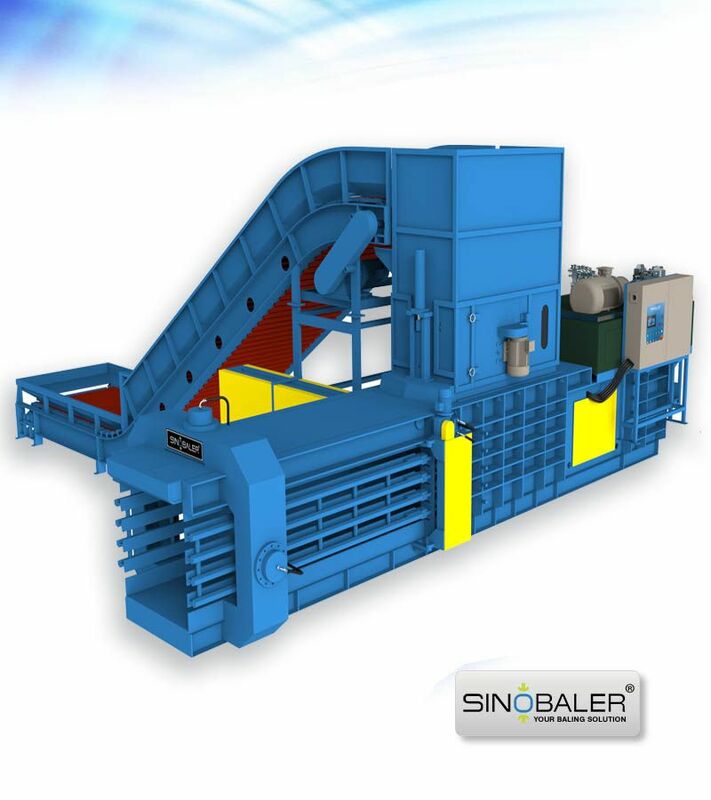 There are two lines of horizontal automatic baler machines in Sinobaler. One is the fully automatic horizontal baling machine. It is is also our flagship line of horizontal open-end baling machine. The other is horizontal briquetting baling machine which represent the latest in baling technology. Boasting technology culled from more than 30 years of research and development, our SHBA2 series fully automatic baling machine has secured a position as China’s top single ram, open-end, auto tie baling press series. The only manpower required is to oversee the material loading onto in-feed conveyor. Like every Sinobaler baling machines, the SHBA2 automatic horizontal baler is also a logical in design, striking a perfect balance between technology, strength, and ease of use. Also its low maintenance requirements and simple operation ensures the SHBA2 series automatic baling machine will yield a positive return on investment. 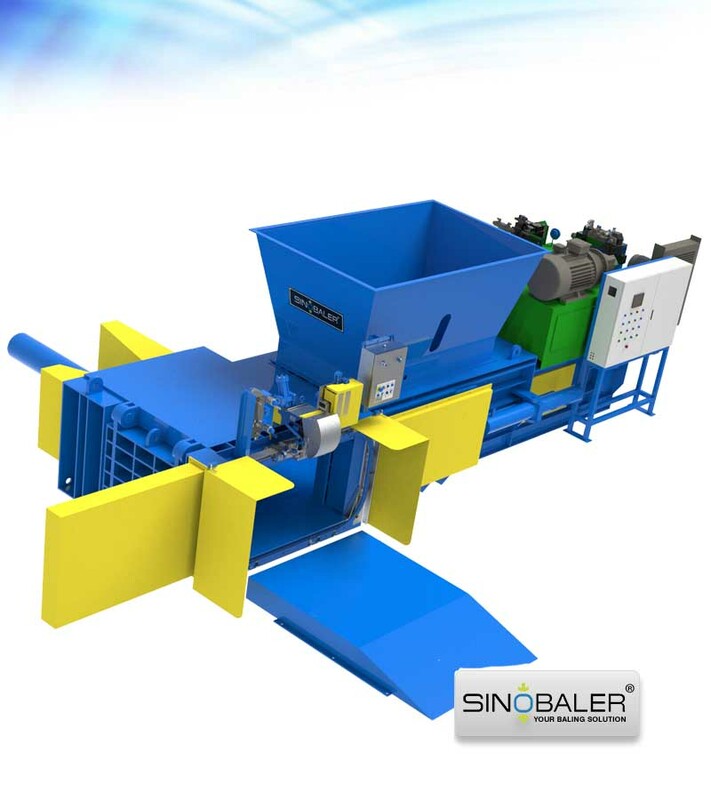 The SHBA2 series automatic baler by Sinobaler is a state of the art fully automatic horizontal baling press machine with compressing force ranging from 40 tons to 120 tons. The fully-integrated manifold block is powered by TEFC industry standard motors. The hydraulic system is controlled by an intelligent and programmable logic controller, which provides fine-tuning capabilities to the operator, as well as advanced internal diagnostics protect the machine against power oscillations, hydraulic malfunctions, and bale size irregularities. This horizontal auto baler can continuously handle cardboard (eg. OCC, carton. also known as horizontal cardboard baler ) , paper (eg. newspaper, kraft paper), soft plastic (eg.plastic film, plastic package, plastic bag), unchopped hay / forage / straw(eg. unchopped rice straw, unchopped wheat straw, corn silage, alfalfa), Hollow plastic (eg.PET bottles, HDPE bottles, LDPE bottles) and other natural fibers (eg. coconut fiber / coir fiber, palm fiber, cellulose fiber, abaca fiber), producing bales weighing from 440 lbs to 2,640 lbs each (200 kgs to 1,200 kgs). These auto tie hydraulic baling presses are ideal for large quantities of recyclables. They can also reach an output of up to 10 tons per hour. If you have lofty expectations about just what a baling machine can do for you, then the SHBA2 series is exactly what you should be looking at. Its a superior, long – lasting baling solution that’s an incredible value. 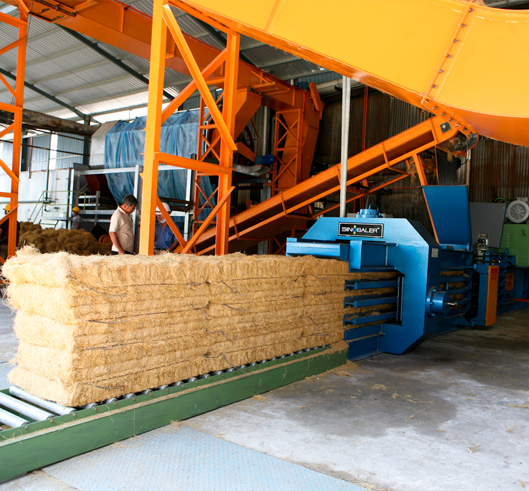 As for Sinobaler horizontal briquetting baling equipment, it represents the latest in baling technology, capable to compress small and loose waste material such as sawdust, wood shavings / wood chips, chopped straw/hay/forage, rice husk / rice hull, cotton seeds, peanut shells or other agricultural residues, into hard briquettes without the need of any packing or strapping. Such briquettes can be easily stored and transported to any energy plants or bio fuel suppliers. 3. Electric controlled for easy operation, simply by operating on buttons and switches to fulfill platen moving and bale ejecting. 4. Automatic feeding conveyor is optional for continuous feeding material. With the help of sensors and PLC, conveyor will automatically start or stop when the material below or above certain position on hopper. Furthermore this enhances feeding speed and maximize throughput. 1. Large square bale for easy transportation and stock. 3. Auto tie operation and automatic feeding conveyor can also save much of your labor cost. 4. Fully automated. Very easy for operation. 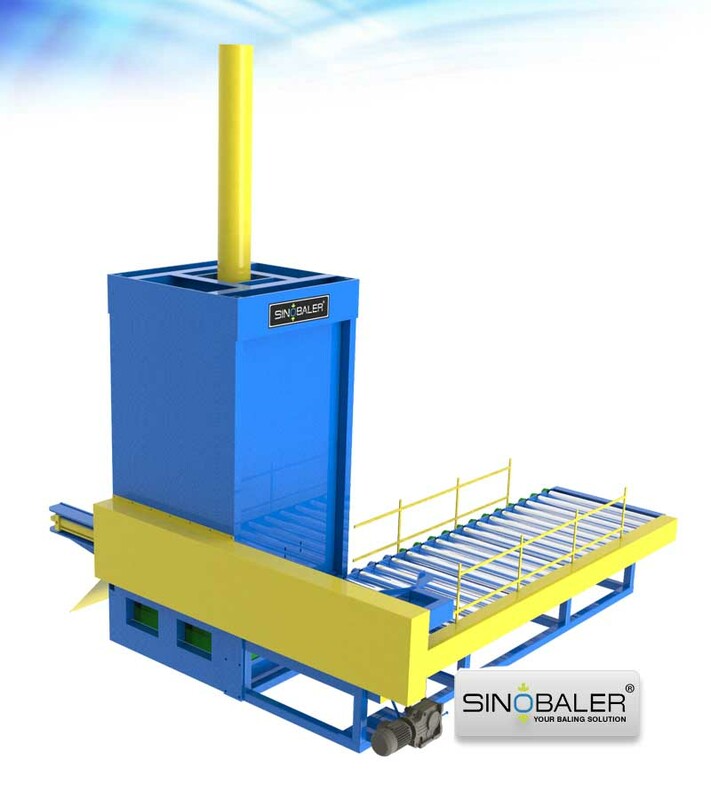 Sinobaler has a full range of waste compactor options, whatever manual operation, semi auto operation and automatic operation, both on in-stock models, and customized models designed from the ground up to meet your waste recycling needs. The bottom line is, if you have a baling need, Sinobaler can also fill it. Hence for more information on automatic baling machines and other waste recycling equipment / baling systems, please feel free to contact us today.